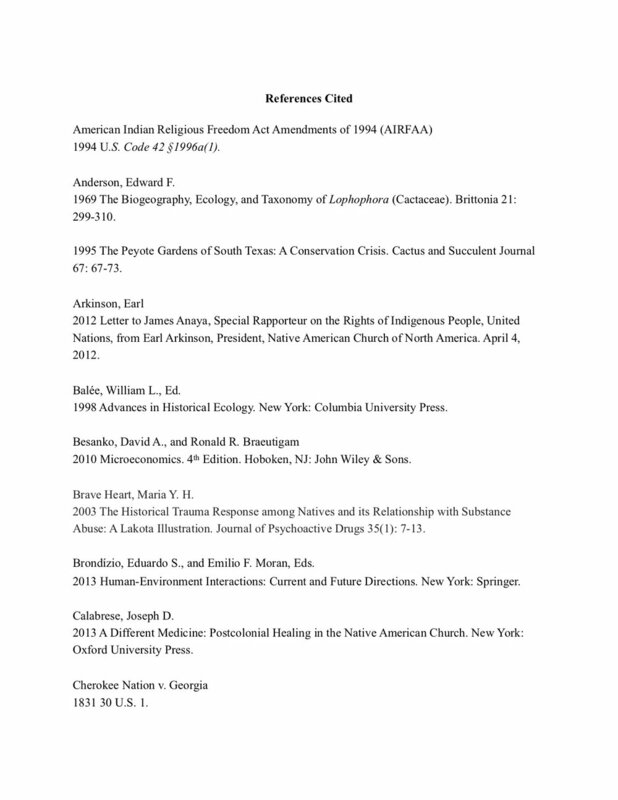 Abstract: Access to the peyote cactus, a religious sacrament of the Native American Church (NAC), has been regulated by the federal government and the state of Texas since the 1960s. Over the last forty years, the number of licensed distributors has declined, a trend accompanied by rising prices and a diminishing market supply of the psychoactive cactus. Distributors are recognized as the primary NAC peyote source; consequently, their disappearance would be devastating for the 250,000-plus adherents of this distinctive indigenous tradition. Based on interviews with current and former peyote distributors, peyote pickers, landowners, and NAC members, a map of the various commodity chains that make up the peyote supply network is constructed. This research applies Access Mapping and Access Analysis of the supply network to identify the primary factors driving the decline of the regulated peyote trade. Focusing on the distributors’ and NAC members’ rights-based, structural, and relational access mechanisms, avenues for increasing access are identified, including amendment of distributor licensing fees. annually harvested and sold in the regulated market, dropping from a high of 2.3 million buttons in 1997 to just over 1.1 million in 2014 (TDPS 2015). The market price for peyote buttons also jumped, from $80/1,000 in 1981 to $170 in 1995 (Anderson 1995) and then soared to $385/1,000 by 2014 (TDPS 2015). Applying supply and demand principles to the data above suggests a simple case of diminished supply (Besanko and Braeutigam 2010); however, supply shortages may occur because of impeded access rather than from biological “scarcity” (Ribot and Peluso 2003; Sen 2010). Impeded access results when certain actors in a supply network encounter barriers that limit their ability to participate in the commodity market. This study of the supply side of the peyote market relies on interviews with current and former peyote distributors, pickers, landowners, and NAC members. Ribot and Peluso’s (2003) Access Theory is used to (1) map the structures and mechanisms that facilitate NAC peyote access; (2) explore the peyote market’s supply and demand dynamics; and (3) elucidate the causes of distributor attrition. Access Theory has previously been used to explore issues regarding access to land (Christensen et al. 2011), water (Westermann 2007), forest resources (Ribot 1998), and to determine the effects of development and changing land-use patterns on resource access in traditional communities (Peluso 1996). Here, Access Theory is used to analyze the interrelationship between dynamic cultural, economic, ecological, and regulatory constraints (Balée 1998; Brondízio and Moran 2013; Kottak 1999) that jeopardize traditional maintenance of and access to a natural, but non-essential, resource. Peyote is unique in that it is a resource with culturally imbued spiritual potency, which also plays an important role in treating psycho-spiritual ailments (Feeney 2014), but which does not contribute to more basic survival needs. It is also distinctive as a natural resource that carries a high degree of cultural salience for marginalized groups while being highly regulated and disparaged by the dominant culture. The [*60] religious use of this cactus, however, is just one example of modern-day balancing acts performed by nations’ attempting to balance the interests of displaced indigenous peoples with policies, often contrary to indigenous interests, which are seen as supporting and protecting both national interests and private property interests. Similar situations exist in Bolivia, Colombia, and other South American countries, with the regulation of coca, and in Brazil and Peru with the regulation of the hallucinogenic brew ayahuasca (Labate and Cavnar 2014). By employing Access Theory to map the web of relations and processes that affect peyote access, this research will apprise licensed distributors, government regulators, and NAC congregations of the potentials and limits of the regulated peyote trade. After identifying network deficiencies, I consider avenues for bolstering access in the peyote supply network, including amending distributor licensing fees and leasing incentives for landowners. I also explore peyote cultivation as a potential extra-market access point for the NAC. Results of this study also apply to other nations similarly balancing access to, and regulation of, culturally significant natural resources, such as coca, khat, or ayahuasca, that have been designated as substances requiring strict controls. Peyote is a small, spineless cactus growing along Texas’s southwestern border in Jim Hogg, Starr, Webb, and Zapata Counties, with an estimated habitat range of between 5,180 and 6,475 km2 (Figure 1). It also grows in Mexico. Peyote can grow solitary, in small groups, or cespitose, though clumps and small clusters of peyote typically grow from a single rootstock (Anderson 1969). Human or animal activity may trigger clustering by damaging the crown (cactus top), which results in a hydra-like response, producing new crowns through lateral branching from viable subterranean stem tissue (Terry and Mauseth 2006). This biological response lends itself to human management, where infrequent harvesting increases future yields of the plant. Unfortunately for commercial pickers, peyote is slow-growing, requiring some ten years to reach maturity from seed (Terry 2003). While restrained harvesting encourages growth through lateral branching, recovery and regrowth take time. A study is currently underway to determine the amount of time a harvested plant requires before it recovers sufficient strength to endure further harvesting (Terry et al. 2011, 2014). So far, investigators have found that plants harvested at two-year intervals exhibit lower growth and higher mortality rates than unharvested individuals, and that plants require more than six years of regrowth to attain pre-harvest levels of crown biomass (Terry et al. 2014). So, while infrequent harvesting (at a minimum of six-year intervals) may increase future yields, repeated harvest of individuals at shorter intervals slows growth. Re-harvesting peyote too frequently produces three important consequences: (1) stress from re-harvesting can kill the plant; (2) regrowth has lower levels of mescaline, peyote’s prized psychoactive compound (Kalam et al. 2013); and (3) insufficient recovery time before re-harvesting leads to the harvest and sale of smaller buttons. Because peyote sales are recorded by the button, and not by weight, it is difficult to compare sales across time. However, one estimate suggests that peyote buttons sold today may be only one-fifth the size of buttons sold thirty years ago (Terry et al. 2011). Others report that peyote buttons, once averaging two to three inches in diameter, are now frequently one to two inches, with buttons as small as United States pennies reported in some NAC ceremonies (Williams 2012). As a result, the drop in sales from the mid-1990s to today is compounded by indeterminable declines in volume and potency, and more buttons must be used in ceremonies to compensate for these losses. While significant changes in the peyote market supply have taken place in the last twenty years, the NAC of North America (NACNA) was already declaring a peyote supply “crisis” in 1995 (The New York Times 1995), a year when demand was estimated at between 5 and 10 million buttons (Anderson 1995). NACNA issued a statement reiterating these same concerns in 2012, concerns likely exacerbated by increases in NAC membership (Prue 2014), declaring that “the peyote that is available to the NAC is of a significantly diminished size, and at times there is no supply at all” (Arkinson 2012:2). Long-standing concern within the NAC, including planning efforts to maintain sufficient access to peyote through importation from Mexico or cultivation (Anderson 1995; Arkinson 2012; The New York Times 1995), suggest that demand has not diminished and supports the conclusion that the problem lies with overall supply. Such a conclusion, however, places an undue emphasis on supply and demand principles and ignores a number of factors that affect individuals’ ability to access resources. While clear market declines and NAC reports of scarcity suggest that United States populations of peyote may be shrinking, peyote does not currently have protected status in the United States. However, peyote is recognized as a species [*61] requiring “special protection” in Mexico (Norma Oficial Mexicana 2010) and is also considered a species liable to become endangered under the Convention on the International Trade in Endangered Species (1973). The International Union for Conservation of Nature has also recently upgraded their categorization of peyote as a species of “least concern” to a status of “vulnerable” (Terry 2013). Despite peyote’s clear vulnerabilities, a proper assessment of United States populations is hampered by the fact that more than 95 percent of land in Texas is privately owned (Institute of Renewable Natural Resources 2014), leaving much to speculation. The conversion of land to private property and the simultaneous removal of Native Americans to reservations during the 19th century expansion of the United States are events historically intertwined with the origin and spread of the peyote religion among Native American groups. Policies for the removal of Native Americans to reservations, and programs of forced assimilation, effectively ended Native American self-determination. The historical emergence of the peyote religion as a major religious movement must be contextualized and understood within this period of ethnocide, where the ability and strength to handle the trauma of cultural and social disintegration wrought by the reservation system and policies of forced acculturation were necessary for the survival of individuals, families, and communities of Native peoples. The peyote religion, with its ethical code, its focus on community and inter-tribal solidarity, and emphasis on spiritual healing through peyote use, emerged as a religious practice that was able to meet many of these individual and community needs as well as to provide reservation life with a sense of hope (Long 2000; Slotkin 1956). The peyote religion was eventually formalized into a series of churches, beginning in 1918 with the establishment of the Native American Church of Oklahoma (Stewart 1987). It continues to play an important role for many Native Americans by perpetuating a sense of Native identity, building communities, and helping to address substance abuse and other manifestations of historical trauma (Calabrese 2013; Feeney 2014). A population’s ability to access traditional resources can substantially impact the culture, potentially affecting the physical and mental health of community members, making a solid understanding of how resources are accessed imperative. Access Theory (Ribot and Peluso 2003) provides a paradigm for understanding (1) particular mechanisms that either facilitate or hinder an actor’s resource access and (2) the multiplicity of ways individuals access and derive benefits from resources. Access depends upon individual “bundles and webs of powers that enable actors to gain, control, and maintain access” to resources (Ribot and Peluso 2003:154-155). Ribot and Peluso specifically characterize “access” as a “bundle of powers,” contrasting it with the typical characterization of “property” as a “bundle of rights” (Proudhon 2007). This distinction between “rights” and “powers” uncovers a crevice that Sikor and Lund (2009:1) term the “grey zone,” where one has “rights” to a resource but lacks the “power” to access it. Access Analysis (application of Access Theory) begins by identifying the commodity of interest, here peyote, and then identifying the various actors in its “web of access” (sensu Ribot and Peluso 2003). The major actors in the peyote trade include landowners, pickers, distributors, and NAC members. Next, one identifies the commodity flow possibilities. Finally, Access Analysis examines mechanisms allowing actors to gain, maintain, and/or control access to resources. Ribot and Peluso (2003) identify two categories of access mechanisms: (1) rights-based mechanisms and (2) structural and relational ones. Rights-based mechanisms refer to rights—sanctioned by law, custom, or convention—that facilitate an actor’s resource access. These include rights conferred by permit or license, like the peyote distributors license (TAC 2008), or by social identity, such as the legal exemption for members of federally recognized tribes to use and possess peyote (AIRFAA 1994). Here, Sikor and Lund’s (2009) concept of the “grey zone”—having rights but lacking access to a resource—becomes important because NAC members have a right to possess and use peyote but have no access guarantees. Rights, however, can be “characterized as legitimate claims that give rise to correlative obligations or duties” (Moser et al. 2001:10). This definition suggests, despite the existence of a “grey zone,” that government may have an obligation to facilitate an individual or group’s ability to exercise their rights or, at least, avoid policies that obstruct the exercise of rights. The federal government’s Trust Responsibility, a legal obligation to protect the interests of recognized tribes in the manner that a guardian would protect the legal interests of his ward (see Cherokee Nation v. Georgia  and Worcester v. Georgia ; see also Peyote Way Church of God v. Thornburgh ), supports this interpretation of rights. The second category of access mechanisms, structural and relational mechanisms, refer more broadly to the “means, processes, and relations” facilitating access (Ribot and Peluso 2003:160). These mechanisms include technology, capital, labor, knowledge, authority, identities, and social relations (Ribot and Peluso 2003). The geographic distance between reservations and South Texas remains a primary impediment to peyote access for Native Americans, one that requires sufficient capital to cover food, transportation, and other travel expenses. Similarly, distributors have their own access mechanisms to consider, including maintaining good social relations with landowners in order to harvest peyote on private property (TAC 2008). After access mechanisms are mapped for each actor, we can evaluate these mechanisms for weaknesses that limit or inhibit specific actors’ market participation. Remedies for access deficiencies can then be explored. Distributors appear to exist at a structurally dominant node in the peyote access web, making an understanding of their access mechanisms particularly important. Distributor decline poses challenges and questions regarding the resilience of the regulated market [*62] and the ability of the NAC to access sufficient quantities of peyote for ceremonies. Figure 2. Within the peyote access web, a number of potential pathways exist to convey peyote from the point of harvest to the end consumer. These can each be seen as individual commodity chains, although they exist within a greater web of access potentialities. Fieldwork was conducted between 2012 and 2015 in Mirando City, Rio Grande City, and Roma in southern Texas, where the remaining distributors live and work (Figure 1). Data were collected through participant observation and semi-structured in-depth interviews with current and former peyote distributors (n=6), current and former peyote pickers (n=15), and landowners (n=3) with peyote habitat on their property. Semi-structured interviews were also conducted with NAC members (n=10). As this study population is difficult to access, participants were identified through a combination of purposive, chain, and opportunistic sampling methods. Fieldnotes and interview transcripts were managed and coded using MAXQDA software. Records were obtained from TDPS (2013, 2015), which has regulated and maintained records on the peyote trade for the last forty years. Other data from records includes gasoline prices from 1986 to 2012 (United States Department of Energy 2015), distributor license fees from 1976 to 2014 (CFR 1971; Federal Register [FR] 1983, 1993, 2003, 2006, 2012), and population growth from 1976 to 2012 for Jim Hogg, Starr, Webb, and Zapata Counties (Texas State Library and Archives Commission 2015). Data on gasoline prices were collected to measure its impact on market access and participation, while census data was collected as a means to measure the impacts of local growth. Gasoline prices, peyote prices, and licensing fees are adjusted for inflation based on 2014 values using Westegg Inflation Calculator (Friedman 2016). Quantifiable data were analyzed using STATA to determine the correlative strength between factors identified from the above research data with data demonstrating declines in distributors, declines in sales, and price increases occurring between the years of 1976 and 2014. The combination of qualitative and quantitative methods allows for the identification of weaknesses in the peyote access web and provides a foundation to explore remedies for these deficiencies. Four primary actors are involved in the peyote trade: distributors, pickers, landowners, and NAC members. Of these, the distributor is the central actor in the peyote access web. Distributors establish and maintain relations and leases with landowners, manage employees (pickers), prepare peyote for sale, and maintain relationships with customers. The primary commodity chain involving the distributor follows peyote from the owner of the property where it grows, to the picker who harvests under a lease, then to the distributor who prepares the peyote for sale to NAC members (Figure 2). Alternately, the distributor may harvest peyote himself, cutting out the picker. One path lets consumers bypass the distributor. This path requires NAC members to establish a relationship with a landowner and procure their own harvesting leases. Other paths involve some degree of unauthorized activity, usually involving trespass, picking without a license, or pickers bypassing distributors to sell directly to NAC members. Unauthorized transfers typically occur within the peyote access web and return to authorized commodity flows. A characteristic example of this comes from an informant who [*63] was stopped by police in 2013 following a day of picking. The informant had his picking license but could not produce a property lease. Consequently, some 200 pounds of harvested peyote were confiscated as illegally obtained. Although the peyote was obtained through unauthorized means (trespassing), the picker was part of the regulated market and intended to sell his harvest to a licensed distributor. Records for 2013 showed that just over 198 pounds of peyote were seized that year (TDPS 2000-2016), indicating that the only seizure involved a licensed picker. Black market demand for peyote is negligible not only in Texas but throughout the United States, a fact used by the Drug Enforcement Administration (DEA) to explain why religious peyote use can be accommodated while religious marijuana use cannot (Olsen v. DEA ). While unauthorized transfers in South Texas occur, they are used to increase an individual’s access to, and participation in, the peyote access web. Beyond the peyote trade’s structure, it is necessary to examine the varying determinants of market entry, how one enters an authorized commodity chain, and the mechanisms of access maintenance. Market entry is generally dependent on an actor’s legal rights or his ability to obtain them, but once the actor meets regulatory requirements, access primarily depends on structural and relational access mechanisms (Table 1). A brief discussion of market actors and their access considerations follows. Distributors are primarily Hispanic and are often the head of a family or part of a husband and wife business team. Traditionally, distributors rely on children, grandchildren, siblings, cousins, nieces, nephews, and neighbors to help collect peyote for sale. If a distributor dies or becomes disabled, the spouse or another close relative typically takes over the family business. While some distributors have worked in peyote full-time, many previously sold peyote to supplement income from migrant work, work in the oil fields, or work as a ranch hand. Migrant work is typically a family endeavor where nuclear, [*64] and sometimes extended, families travel during the spring and summer months and work together as a single economic unit. Distributors’ families that participated in migrant work would return to their homes to work the fall and winter months in peyote. However, as South Texas’s population has grown and economic opportunities have expanded, the number of people participating in migrant work have diminished (no distributors currently participate in migrant work). While distributors have been both men and women in the past, the remaining distributors are all men, two in their sixties and one in his seventies. The potential distributor has the most difficult path to enter the peyote market, having first to apply for and receive licenses from the DEA and from TDPS, the two agencies that regulate the peyote market. The DEA screens new applicants for felony drug convictions and imposes an annual registration fee of $1,523 (FR 2012). TDPS requires that distributors annually submit a letter attesting to their moral character from a local judge, chief of police, or sheriff (TAC 2008 §13.43), with a $25 processing fee (§13.27[a]). On state and federal applications, the distributor must also declare at least one property where peyote will be harvested and must list the names and contact information of the landowners. Finally, the applicant must provide a list of names and social security numbers of individuals who will harvest peyote on the distributor’s behalf. Besides licensing requirements, additional expenses include land leases, which range from several hundred to several thousand dollars depending on lease terms, pay for pickers to stock peyote, and expenses for secure storage befitting a controlled substance. Pickers are also typically Hispanic and usually distributors’ relatives but are often neighbors, family friends, or individuals in need of extra income. Young family members often work in peyote for a few years to help the family and earn extra spending money and then typically find full-time employment elsewhere. Other pickers may have limited employment opportunities due to age, language barriers, legal problems, or legal status, while others prefer the flexibility of peyote work and the benefit of daily pay. In 2013, there were fifty-eight pickers registered with TDPS, mostly men ranging in age from seventeen to seventy-one years old. The average age of pickers was forty-two (TDPS 2013). Pickers must procure a license through a licensed distributor. Pickers do not need to pass criminal background checks but must be United States citizens, which eliminates numerous potential workers in this Texas-Mexico border region. A picker must be able-bodied, have transportation, and sometimes have access to properties independent of the distributor. Picking peyote requires stamina and common sense. A picker may walk up to five miles in a day and may harvest up to 100 pounds, which has to be hauled back to the road. Transportation needs require access to a vehicle and money for gasoline. Some drive in groups, and others may pay someone with a vehicle for rides. Landowner identities vary regionally. Eighteenth century Spanish sub-divided the Lower Rio Grande Valley into porciones (4,428 acres), which were allotted to Spanish families and families of Hispanicized Indians (Morgan and Stewart 1984). Porciones became smaller generationally as multiple children inherited and divided the land. Many also traded land for tools or food. As a result, ranches along the Rio Grande are small but generally remain held by Hispanic families. The family nature of the southern ranches has helped distributors to access ranches through social networks of relatives, neighbors, and community members. Inland in the Mirando Valley and elsewhere, land grants, intended for cattle grazing, were substantially larger than those allotted in the Lower Valley along the Rio Grande (Lang and Long 2010). These upper-class designated land grants, some as large as 600,000 acres, remain relatively large. The early 20th century discovery of oil in the Mirando Valley increased land values and prevented land from being broken up and sold. Because of differing land allotments according to class, ranches in the northern part of peyote’s range remain large, and many have passed from Hispanic to Anglo ranchers, limiting opportunities for distributors to access land through family relations. Distributors in the Mirando Valley generally rely on expensive leases to access land, though social connections are still vital. One northern distributor explained that leasing opportunities were rare but that he was able to pick on a property where his father worked as a ranch hand. Market entry for landowners depends on the presence of peyote on their property and on social connections with either licensed pickers, distributors, or NAC members. There are no federal or state fees involved, though basing fees on quantities of peyote harvested is considered a sale and prohibited without a license (TAC 2008: §13.55). There are no significant legal impediments for landowners’ participation in the peyote market; however, informants raised several concerns with leasing their lands, including potential liability for accidents or injuries sustained by lessees on the property and concern that lessees will return without permission. Currently, members of more than 100 tribes claim NAC membership, with representatives of seventy different tribes making purchases in the peyote market annually. There are approximately 200 different NAC chapters, some with multiple congregations, located in twenty-nine states and Canada (TDPS 2013). While chapters are widespread, NAC activity is most concentrated in Arizona, New Mexico, and Oklahoma. Members from these states prefer traveling to Texas to purchase peyote and visit the revered “peyote gardens.” Some have arrangements with landowners to harvest their own peyote, while others rely primarily on distributors. Members often characterize this journey as a religious pilgrimage. Members who live farther away are more likely to order peyote through the mail and may never visit the peyote gardens, though they consider it a special privilege to do so. NAC members have several rights-based access considerations. Federally recognized tribe members are exempt from the federal prohibition of peyote under AIRFAA (1994), while those with a one-quarter Native American blood quantum are exempt in Texas (TAC 2008). Additionally, Texas requires NAC members to carry travel permits printed on NAC stationary, signed by an NAC officer, and containing identifying information. Texas law recommends that travel permits include information regarding how much peyote will be purchased and where. Different chapters may impose additional restrictions on travel permits. Some reportedly charge members for permits, and others impose purchase limitations. Members, who must have sufficient capital to cover travel expenses including gasoline, food, and lodging, in addition to their planned peyote purchases, express frustration regarding the purchase limitation because it prevents bulk purchases and necessitates more frequent travel. Peyote sales have been declining since 1997 (Figure 3). Interviews with distributors and pickers suggest that both declines in customers and increased difficulty in obtaining peyote have contributed to declining sales. Informants report that the number of annual customers has declined and believe that rising gasoline prices have prevented many NAC members from traveling to purchase peyote. This perception is generally corroborated by NAC members who frequently mentioned (8/10 informants) travel expense as a primary barrier to accessing peyote. A correlation analysis to test the relationship between sales and gasoline prices between 1986 and 2012 demonstrated a significant negative relationship (r  = -0.69, p < .01), suggesting many NAC members choose to stay home when gasoline prices are high. However, an examination of sales records between 2003 and 2012 shows an annual variation of between 650 and 800 individual sales with no clear trends up or down (TDPS 2013). This discrepancy partly results from an increased reliance on mail order purchases when gasoline prices are high (r  = 0.8352, p < .01). Most distributors decline to mail fresh peyote due to its substantial weight (1,000 fresh buttons weigh between 80 and 100 pounds) and the associated shipping costs. One of the remaining distributors, however, does ship significant amounts of fresh peyote. Due to the weight, a single order may be split into two to four different shipments. Regulations require that [*66] a receipt be included in each individual package (TAC 2008: §13.51a(3)[E]), so a single order may require several receipts. Consequently, the number of individual recorded sales, which appears steady, is artificially high. This receipt inflation helps explain the discrepancy between distributor perceptions of a declining customer base and the number of recorded sales, which otherwise suggest steady business. In any case, mail order purchases haven’t sufficiently increased when gasoline prices are high to offset sales declines. Diminished market supplies of peyote can partially be explained by declining access to land and attrition among pickers; however, there is a general consensus among informants that scarcity is a primary problem. One former distributor explained, “Sometimes you find land [to lease], but there’s no peyote…you see the ground and it was peyote ground. The trees and everything…but there was no peyote.” As access to land declines, many pickers risk trespassing in order to reach prime peyote habitat; however, several pickers lamented that they are only able to pick half as much in a day as they were able to pick just twenty years ago. Others complained that pickers have to drive and walk farther than before to find peyote. One picker stated, “Now you got to go up ten, fifteen miles out, thirty miles out, fifty miles out, to go look for the [peyote]…you got to go out, way out.” That pickers are driving greater distances to pick suggests that local populations have been reduced to the point that local harvesting, with or without permission, is no longer economically viable. As gasoline expenses for pickers rise, so too do costs for distributors—costs which are passed on to the consumer. These circumstances result in a complex supply-demand where diminished supplies lead to price increases necessary to cover distributor expenses and then to decreased purchasing power among consumers, which then results in further drops in sales and revenue for distributors. This leaves distributors less able to pay pickers and maintain a minimum market supply of peyote. Relatedly, the number of licensed distributors is another important factor when considering market supply. When asked about the importance of distributors in facilitating peyote access, NAC informants were nearly unanimous (9/10) that the distributors played a “very important” if not “essential” role in facilitating access. A significant majority (8/10) also reported that “most” or “all” of their chapter’s peyote supply came from distributors. Nevertheless, only half (5/10) reported that they were able to acquire the desired amount of peyote from distributors, suggesting that the number of distributors licensed may impact overall market supply, and thus, the degree of NAC access. To test the connection between NAC market access and the number of distributors, a correlation analysis was run on recorded market sales and numbers of licensed distributors between 1986 and 2014 (Figure 4). The results showed a significant positive relationship between sales and distributors (r  = 0.7258, p < .01). If one assumes that demand for peyote has not declined, as many NAC members maintain, the analysis suggests that the number of distributors limits the amount of peyote that reaches the market. If this is correct, then determining why attrition is high among distributors becomes a paramount consideration when determining how to address declining peyote access among NAC members. Informants frequently cited the following reasons for distributor decline: (1) insufficient income and capital; (2) insufficient land access; (3) insufficient labor access; and (4) peyote scarcity. These causes are interconnected, and it is likely that a combination of the above reasons has led to the dramatic decline in licensed distributors over the last forty years. The potential distributor must have sufficient capital to pay licensing fees and cover start-up costs, while the working distributor must earn sufficient income to cover annual licensing fees as well as leases and other business expenses. While the TDPS fee is low at $25 (TAC 2008: §13.27[a]), the DEA fee for controlled substance distributors has risen precipitously, increasing from $25 in 1976 to $1,523 by 2012 (FR 1983, 2012). Several informants indicated that high licensing fees, along with other start-up costs, are impediments for potential distributors. One picker decided against getting a license because “the license was going up” and because of associated expenses with creating a secure storage place. Another speculated that potential distributors “don’t want to buy the license because they don’t get enough ranches or places to go…. They don’t want to buy it for a thousand dollars,” indicating that both land access and licensing fees are important considerations for potential distributors. A correlation analysis was run to test the strength of the relationship between the number of licensed distributors and licensing fees between 1976 and 2014 (Figure 5). The results show a significant negative relationship between rising licensing fees and number of distributors (r  = -0.7295, p < .01), suggesting that increased fees have increased difficulty for existing distributors to maintain their licenses (particularly if they operate on a small-scale) and have prevented potential distributors from entering the market. Interestingly, the DEA groups peyote distributors alongside drug wholesalers, with multimillion dollar annual revenue streams, for fee purposes, while also recognizing a “dispensing” fee category, applied to medical practitioners, hospitals, clinics, pharmacies, and instructional institutions, which is subject to a 84 percent lower fee ($244) than distributors (FR 2012). Individuals and businesses classified as dispensers are distinguished from distributors by their size, with annual revenues below six million, by the possession and use of small quantities of controlled substances with low-level purity, and an authorization limited to Schedule II-V substances. While peyote is a Schedule I drug, it is a low purity substance (vegetable matter) handled by peyote distributors in small quantities, making the distributor more akin to dispensers than to drug wholesalers. Before implementing fee changes in 2012, the DEA examined how a $60 fee increase would impact physicians, dentists, and other dispensers. They found that the increase was “not an economically significant regulatory action,” accounting for less than 0.05 percent of average income (FR 2012:15247-15248). The same courtesy was not extended to peyote distributors, who faced a $376 increase and pay an income percentage six times higher than dispensers, despite [*68] comparable incomes (Table 2). Compared to other distributors, peyote distributors pay a percentage of income (0.83%) thirteen times higher than small “miscellaneous” wholesalers (0.06%) and 247 times higher than Grocery Wholesalers (0.003%) (FR 2012). This inequity suggests that the DEA misclassifies peyote distributors and, when combined with the analysis above, indicates that the fee is highly prohibitive. The remaining considerations, (1) access to land and labor and (2) peyote scarcity, result from local development and population growth. With population growth (the populations of both Starr and Webb Counties have doubled in the last thirty years), land values have increased, and many local families have capitalized by selling land. Wind, oil, and natural gas companies have purchased major leases, while farmers have root-plowed other lands for cattle grazing. Urban growth combined with other development activities eliminated significant amounts of habitat and made large tracts of land unavailable for harvest. A correlation analysis was run on the numbers of licensed distributors and population growth in Jim Hogg, Starr, Webb, and Zapata Counties between 1976 and 2012 and found a significant negative relationship between population growth and distributor numbers (r  = -0.8449, p < .01). These results support informants’ reports that decreased access to land due to growth and development has made market participation increasingly difficult for distributors. Table 2: DEA Fee as Percentage of Income. Distributor income is provided as gross income. Net income is unknown, but informants report that after leasing fees and employee pay net income is close to 50 percent of gross. This would put DEA fees at, or above, 1 percent of distributor’s net income. Now they got more jobs because there’s a lot of stores and things like that. But twenty years ago, like I said, this town [Rio Grande City] grew up, in twenty years grew up a lot. So there’s jobs for the young guys now. Back then there wasn’t no jobs. Only the fields, or up north and come back. And when they come back they would work on the medicine [peyote]. You know, like October, November, December, January. And then, like in March, April they went back. So that’s the way it worked you know. To test the connection between growth and picker decline, a correlation analysis was run on the numbers of licensed pickers and population in Jim Hogg, Starr, Webb, and Zapata Counties between 2003 and 2012. Results were not significant but indicated a negative relationship between population growth and number of pickers (r  = -0.4326, p > .01). Though more data is necessary, this relationship may suggest that as the population grows and economic opportunities increase, individuals are less likely to seek or continue employment as peyote pickers. Picker decline also likely contributes to the significant relationship found between distributor decline and population growth (r  = -0.8449, p < .01). While development and harvesting pressures impact peyote market supplies, diminished supply also reflects changes to market actors’ “bundles of powers.” Some of these powers arise from the particular “rights” of specific actors; other powers come from structural and relational [*69] access mechanisms. Market actors’ rights have not changed significantly since the peyote market became regulated, with the exception of the fees imposed upon distributors. Rising fees created barriers to market entry for potential distributors and pushed small-scale and part-time distributors out of the market. Because distributors rely on personal networks to access land and build their labor force, the loss of a distributor also results in declines in both acres harvested and active pickers. Therefore, less peyote makes it to market, competition decreases, prices increase, and consumer choice declines. Changes to structural and relational access mechanisms also impacted market participation and peyote’s overall market availability. The bundle of powers necessary for distributors to be successful—primarily access to land and labor—has weakened significantly with local growth and development. As cities such as Laredo, Rio Grande City, and McAllen have grown, so too have full-time job opportunities. Many former and would-be pickers have foregone the dangers of snakebites, dehydration, heat exhaustion, and the inconsistent successes of picking peyote for regular, steady work, while peyote’s habitat continues to be developed for oil and wind farms or for municipal expansion. Rising annual expenses, including license fees, costs of worker retention, and land leases, mean that access to capital is also increasingly important for distributors. NAC rights-based access mechanisms haven’t changed much over the last forty years, but their ability to exercise their right to pray with peyote has diminished significantly. As the number of distributors has declined, so too have peyote market supplies. Additionally, increasing gasoline and peyote prices have diminished NAC members’ purchasing power, leading to more frugal purchases and less peyote available for religious services. Declining peyote access poses a number of risks for the NAC, a considerable Native American cultural institution that has played an important role in strengthening Native communities and in combatting historical trauma and related alcohol and drug addiction (Brave Heart 2003; Calabrese 2013; Feeney 2014; Watts and Gutierres 1997). As peyote availability decreases, the frequency of ceremonies will likely decrease, fewer opportunities will be available for youth to become involved, and participation will stagnate. Peyote is central to the NAC: without it, the NAC, along with the community support it provides, will wane. NAC members will be stuck in Sikor and Lund’s “grey zone,” where they have protected rights that they cannot use. While development marches on, some strategic regulatory changes could bolster individuals’ ability to participate in the peyote market as distributors and increase levels of consumer access by increasing market supply or could open new peyote access avenues for NAC members. Market regulations are intended to prevent diversion of peyote to the black market, but certain regulatory components merely hinder legal market participation and ultimately obstruct the ability of NAC members to exercise their rights. The rapidly rising licensing fees, for example, were not designed with peyote distributors in mind but with the revenue building potential of drug wholesalers, whose annual revenues range between $2,741,857 and $71,437,205 (FR 2012:15246). With only three distributors, less than 800 individual sales per year, and annual revenue well below $1,000,000, the peyote market is miniscule in comparison. Peyote distributors are more akin to dispensers, and a reassignment to the dispensing category with the requisite fee reduction could create greater access for prospective distributors. Greater participation in the market could increase overall market supplies of peyote, while increased competition would deter price inflation for NAC congregants. An alternative would be to allow chapters of the NAC to cultivate their own peyote. The passage of AIRFAA (§b2) in 1994 not only codified the religious rights of Native Americans to use peyote but also opened the door to regulated cultivation. The DEA has not offered any specific regulations regarding the cultivation of peyote, so regulations would likely default to the rules and fees established for the manufacture of a controlled substance, the same fees that apply to the pharmaceutical industry. The current licensing fee for manufacturers is $3,047 (FR 2012), an exorbitant amount for a plant that may take ten years to reach maturity from seed (Terry 2003). Under such a system, any NAC chapter that undertook cultivation would spend over $30,000 before it reaped the rewards of its efforts. With peyote currently selling at $385/1,000, an individual chapter would need to plant and harvest over 78,000 peyotes to break even, without including any horticultural expenses. A separate, reduced-fee licensing system for Native American religious use would be necessary to make cultivation by NAC chapters feasible. Alternatively, the United States Department of Justice (DOJ) might adopt a hands-off approach to peyote cultivation on reservations similar to the one adopted regarding enforcement of marijuana laws on reservations (DOJ 2014). The DOJ (2014:2) has not legalized marijuana for tribes but limits its “investigative and prosecutorial resources” to prioritized areas, for example, black market diversion. Similarly, DOJ might adopt a policy limiting federal investigations to instances involving evidence of diversion outside of the NAC. This would further the government’s goal of cultural and religious preservation under the Trust Responsibility but would leave NAC rights in a grey area. Another approach would be to create incentives for landowners to work with either distributors or NAC chapters. Texas has the fifth highest property taxes in the United States (Kiernan 2016), and the adoption of a tax break for landowners, when combined with leasing fees, could help compel reluctant landowners to work with distributors and expand access to peyote habitat. Such a mechanism could be targeted more specifically to landowners developing or plowing their properties to encourage conservation through the salvaging and transplanting of peyote plants that would otherwise be destroyed. Salvaged plants could be used by individual NAC chapters to jump-start cultivation programs or could be removed by distributors to maintain on family ranches for [*70] future harvests. Due to the plant removal, landowners would not need to worry about lessees returning to pick peyote unsupervised. This approach could increase access and aid the development of cultivation programs while also protecting plants that would otherwise be destroyed. While some sectors of the NAC have advocated for importation from Mexico, the reality of working with multiple states under international law, and the bureaucratic barriers and political complexities that attend such an endeavor, portend poorly for any prompt positive outcomes. Ultimately, federal regulations that obstruct the exercise of NAC rights and that put Native American cultural and religious practices at risk should be revised in keeping with federal duties to Native peoples. The best avenue for preserving NAC peyote access would include a fee reduction for peyote distributors, through reclassification as dispensers, and clear regulations for cultivation by individual NAC chapters for a reasonable licensing fee. While a fee reduction for distributors may not reverse the twenty-year decline in the peyote market, it would deter further market erosion and foster a minimum market supply of peyote for the immediate future. Combined with licensing for cultivation, the distributor fee reduction would provide NAC chapters with a buffer period for setting up peyote cultivation operations that could eventually meet most of the licensed chapter’s needs. A peyote salvaging program in Texas could also help jump-start cultivation projects or allow distributors to restock family ranches. If the peyote market continues to decline despite changes to licensing fees, the above recommendations will ensure a degree of self-sufficiency and access for NAC chapters that choose to pursue cultivation, despite further market erosion. The present case study examines the supply side of the peyote market. Market demand comes from the NAC, a large religion with membership exceeding 250,000 individuals across the United States and Canada. Ten NAC congregants contributed to this research. While interviewees were drawn from a variety of tribes, an expansive demand-side investigation would determine how, and to what degree, declines in the peyote market adversely affect the NAC. Geographical and financial differences among tribes likely influence the degree to which NAC chapters are affected, and an investigation across tribes and chapters would clarify how market declines affect the NAC and whether particular groups are more vulnerable to market changes than others. Such an investigation could also clarify to what degree declines in market participation result from declines in demand rather than decreased purchasing power. Over the last forty years, the number of licensed peyote distributors steadily declined, a trend accompanied by rising prices and a diminishing market supply. While there are indicators that peyote’s Texas habitat is shrinking due to development, overharvesting, and other pressures, application of Access Theory and Access Analysis demonstrates that changes in market actors’ “bundles of powers” precipitate dwindling market supplies. These bundles of powers consist of rights-based, structural, and relational mechanisms that facilitate an individual actor’s market access. As demonstrated above, actors in the peyote market experiencing the most pronounced changes in market access are the distributors and NAC members. The impact of growth and development on distributors’ structural and relational access mechanisms may not be fully reversible; however, regulations that limit rights-based access mechanisms are subject to revision. Research results demonstrate that the number of licensed distributors affects NAC peyote access and that the number of distributors declines with rising licensing fees. Reassigning peyote distributors to the dispenser licensing category would reduce the prohibitive impacts of the current fee requirement and raise the financial feasibility for individuals seeking a distributor’s license, as well as prevent attrition among the remaining distributors. While such an action directly benefits the distributors, expanding the distributor base will also expand the market supply of peyote and stabilize prices through increased market competition, results that ultimately benefit the NAC. The adoption of federal regulations for the cultivation of peyote by the NAC may be a necessary and complementary step to adjusting distributor fees to ensure continued NAC access to peyote, thereby upholding the government’s duties under the Trust Responsibility. Kevin Feeney received his Ph.D. from Washington State University in 2016 and is currently a Lecturer at Central Washington University. Research for this paper was supported by a grant from the Research Committee of the Cactus and Succulent Society of America (CSSA). In addition to the CSSA, a special thanks goes to Marsha Quinlan, Martin Terry, and Kristin Safi for their feedback and support in the preparation of this manuscript.